Tips to Make Daily Production Report Quickly? 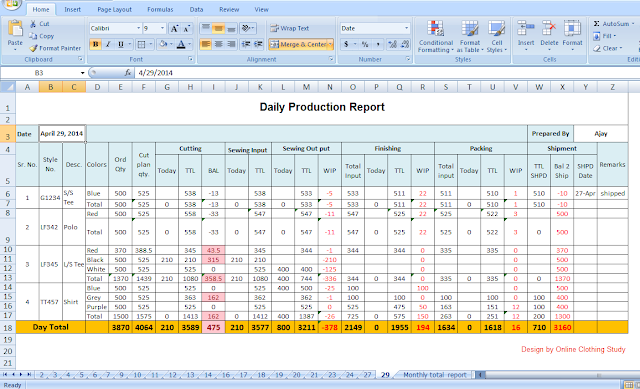 Is your morning task to make Daily Production Report (DPR)? Does it take too much time of yours? Read this article and find ways to make your daily report quickly. Why it takes too much time to finish Daily Production Report? Data operator does too much experiment on the excel sheet while making report etc. In many factories, DPR is made by Industrial Engineering department. Either report is made by IE or data operator. Whoever is making the report, following tips would help them to be on track. In the small set-up, a full-time computer is not given to the IE or data operator. If you are working on a shared computer, make sure that you get the computer in morning for half an hour. To prepare DPR, the second thing you need after the computer is production information from various departments. Departments like Cutting, Sewing, Packing, and Finishing etc. Give them a simple printed format to make department wise production report for you. Use formatted and formulated spreadsheet. Do not try analysis data daily. Instead, prepare templates for charts and graphs that you need for reporting. In the morning just collect and enter data in the specific tables. Keep other tasks aside in the morning and concentrate on the data entry. Work on a minimum number of files for daily reports. Single file is the best for a month. Create date-wise separate sheet in the same file. Save all production report files into the same folder. Create a shortcut of the folder in desktop. You can also share and save report folder in a shared location. This way you can work on the production report file from other computers (provided that other computers are in local network). In case you are slow in working on Excel table, don’t know much about shortcut keys, formatting of tables, cross-checking of calculation, the basic formula for auto calculation, practice when you get time. Ask for help and learn from others. By following above tips you can surely reduce report making time. Download sample daily production report with instructions and Monthly Report sheet by clicking the following download link. Do you like above tips? Show your love by sharing this post. Online Clothing Study: Tips to Make Daily Production Report Quickly? 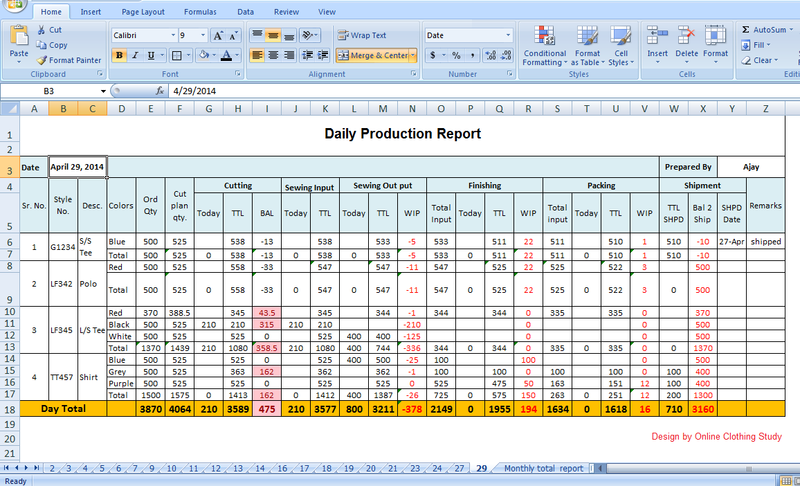 Tips that help you making your quicker specially Daily Production Report. This is a common report made by most of the garment factories.